Could be used as in a lesson or unit on Antarctica and climate change. Effective brief framing tool for use as an introduction to a unit on paleoclimatology or "how do scientists know what they know?" The video does not delve into details of paleoclimatology. Teachers could also use this video to have a discussion about young women in climate science. Progression of time that is captured in the ice cores should be clarified by the educator. 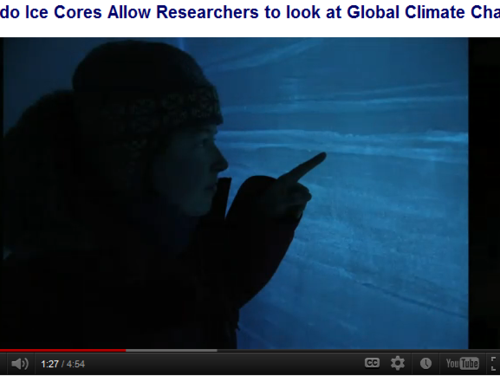 The video shows how ice cores are handled and measurements taken in an Antarctic lab. The PhD student working with the ice cores discusses what variables of atmospheric chemistry are measured. Comments from expert scientist: This video introduces the concepts of annual variations within ice cores, and gives the viewer a feeling for the methods involved in taking ice core measurements. It also describes why ice cores are useful as paleoclimate records, and briefly touches on the limitations of individual proxy records. The narrator states that global temperature can be determined from Antarctic ice cores, which isn't correct- only global temperature trends as indicated by sea level and greenhouse gas content can be approximated. Overall, this was one of the best videos on the cryosphere. The two narrators of the video are young female researchers. This provides a nice opportunity for students to see that researchers can be relatively young, and can be women.